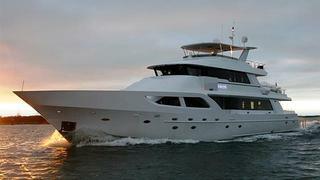 News in overnight from Wes Sanford at Northrop & Johnson that he's listed Crescent's 36.6m motor yacht Encore for sale. Built in 1992, Encore recently had a radical rebuild at Platinum Marine, including the addition of an upper deck and skylounge, modernised exterior styling, a much larger swim platform and a complete paint job. The interior of the new tri-level vessel was removed and replaced with a professionally designed interior, including up-to-date amenities such as a state-of-the-art entertainment system, technically advanced lighting systems, and a chef’s galley. Mechanical, electronic, and hotel yacht management systems have been either significantly upgraded or replaced throughout Encore. The navigation suite and yacht management systems have been updated to the latest high tech standards and the twin 1450hp Detroit Diesel engines have been completely rebuilt. Accommodation is for eight guests and she cruises at 15 knots. Now a virtually new yacht, Encore is asking $6,995,000.